I must say I’m really getting into sharing reviews of books I’ve read on this blog. This one is of the latest novel by Shannon A Thompson. This was an exciting, intriguing tale. In the dystopian world Sophia, her family and friends are living in, there is a war on between the State who control the various regions in this post-modern America and those who use and promote a clairvoyant drug. At the beginning of the story Sophia has an unusual encounter with a mysterious boy in the woods. After meeting him her life will not be the same. As the story unfolds, Sophia learns things about her family and friends that she’d been blind to before, some of it shocking. At the same time she begins to get to know the boy in the woods better and he draws her into his world. I really enjoyed this book. It was refreshing and different. I haven’t read a whole lot of dystopian fiction before, but what I liked about this was the different angle it gave – a war on a very potent drug. I thought it was brave of the author to tackle the subject of drug abuse – even indirectly like this. Drug abuse and its effects is a very divisive issue and I thought Thompson handled it skillfully. As the author, I felt she remained neutral on the subject and just allowed her story to flow, the characters to discover things about themselves that they didn’t know, and the reader to make up their own mind. Of course, drug abuse isn’t the only aspect to this book. The relationships between the characters were well drawn and, at times, heartbreaking. None of them were black and white, not even Sophia, which I thought was realistic and one of the attractions of the story as a whole. On the whole I thought that this was an excellent book, gripping and exciting and well worth a read. I would recommend it to anyone who enjoys an exciting, edge-of-your-seat, thrilling story. Next ›Call for volunteers for cover reveal for Reunion of the Heart! 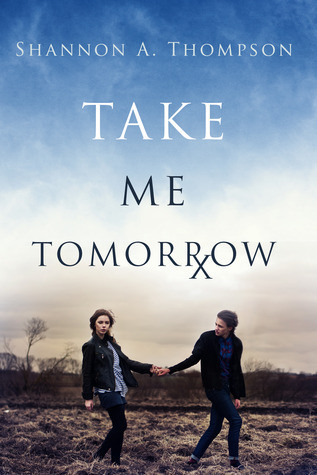 Thank you for reading Take Me Tomorrow! Great review! I love this genre and I can’t wait to read this! Thanks Elaine. I love your blog! As I’m new to the blogging world maybe I’ll get some good ideas. Glad you enjoyed this book. Hope you’ll read other dystopian fiction too (like the Hunger Games books).